Can electric equipment provide the right power at the right cost? Horticulture pros are working to find a balance. There’s a longstanding contradiction in the horticultural trades. Green professionals are driven by their passion for plants, the environment and a belief in the importance of healthy, active lifestyles connected with nature. However, their work often depends on fossil fuel-burning, greenhouse gas-emitting equipment and machinery. The paradox is not unique to the horticultural trades. Look to any international climate change conference, for instance, where thousands of diplomats and bureaucrats burn countless gallons of jet fuel travelling to the world’s great cities for photo ops, gala dinners and to outline ersatz environmental strategies. But while politicians and policy makers have alternatives they could use to curtail their hypocrisy — it’s 2017, why not discuss climate change from afar over Skype? — work in the green profession often demands the power of the combustion engine. There are signs, however, that gas and diesel equipment use in the green professions may soon go the way of the dodo bird. While equipment and vehicle manufacturers still face major challenges when it comes to electric landscaping equipment, especially with heavy machinery and trucks, recent advances make it possible to imagine a time when the green profession will be truly green. 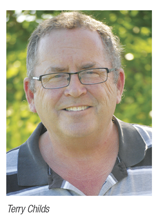 Terry Childs, president of Nature’s Way Landscaping in Gananoque Ont., is a knowledgeable and keen advocate for sustainability and the environment. In fact, in 2010 Childs installed a microFIT solar power production system at his operations yard. The panels have produced 9,918 KWH over that period, which is sold to Ontario Hydro. Childs also decided to go electric on the maintenance end of his business in 2014. By the second season, significant battery life issues caused Childs to transition back to traditional, greenhouse gas-emitting equipment. While the upfront cost of equipment and batteries is more expensive than traditional equipment, the lower maintenance and fuel costs of electric equipment bridges the gap over time, Childs says. But it only makes sense if the battery life is long and stable. Leading into the 2017 season, Childs is once again looking at purchasing electric equipment for his maintenance team, hopeful that upgraded technology in newer product lines has pushed battery power past the tipping point to where it is now cost-effective. Michael Gucciardi, environmental sustainability manager for Mississauga, Ont.-based International Landscaping, has an academic background in environmental studies and 10 years of experience working in the maintenance and construction divisions of his family’s award-winning business. In June 2016, he spearheaded the launch of the company’s all-electric maintenance crew — complete with zero-turn mowers, push mowers, trimmers, blowers and an enclosed trailer customized with charging docks and a portable solar panel system to generate power on site. The crew spent a season servicing Mississauga’s 170-acre Meadowvale North Business Park. With one season in the books, Guicciardi is pleased with the equipment’s performance. But there have been several issues. Guicciardi also notes that some U.S. states offer financial incentives for landscaping companies to go green, something he’d obviously love to see at the provincial or federal level in Canada. It’s been a learning curve, but, having embarked in an electric partnership with a major property management firm, Guicciardi and International Landscaping are committed to exploring options to make it work. Indeed, prior to purchasing the electric equipment, Guicciardi did extensive research into the greenhouse gas emission-free products offered by a variety of suppliers. 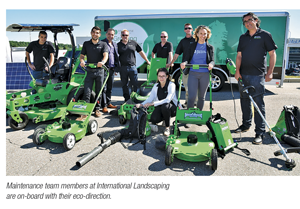 He’s optimistic that professional grade electric equipment will continue to improve each year, eventually making it possible for International Landscaping to go fully electric. With the Meadowvale North Business Park electric project, International Landscaping and Guicciardi have shown how a creative business partnership — in this case, with property management firm Bentall Kennedy — can lead to innovation. By teaming up with a high-end, environmentally conscious client, IL was able to launch the pilot project and outfit a crew. Going forward, they will have gained valuable knowledge about how to make a fully electric maintenance team work. And Guicciardi is relishing the opportunity. Over the last two years, Sundaura Alford-Purvis has utilized a fully-electric car for her landscape design practice. Based in Ottawa, Ont., Alford-Purvis meets with clients and travels to job sites daily during the busy seasons and says she spends up to 80 per cent less on fuel costs — charging her Nissan Leaf hatchback at home or at local e-stations — than she did with a traditional vehicle. While the sticker price for an electric vehicle is significantly higher than gas vehicles in the same class, government subsidies, fuel savings and lower maintenance costs quickly balance things out. Alford-Purvis received some $10,000 from the Ontario government. “For landscape designers, consultants, sales staff, or say a foreperson who is supervising multiple sites, really anyone who needs a vehicle but doesn’t have to haul material or equipment, it already makes a lot of sense to go electric,” she says. It takes about three to four hours to fully charge her car, Alford-Purvis says, and when using hydro at her home during off-peak hours, between $1.50 to $2 of hydro will provide 140 km of travel. And it’s not a tiny vehicle either. “I know for a fact that I can fit eight ft. long two-by-fours in it and close the trunk,” she says, with a laugh. Many, if not all, green professionals across the country are interested in utilizing electric equipment for the environmental benefits and the branding and marketing opportunities, but the economics have to make sense. While there have been significant improvements to electric and battery powered equipment, there is still a long way to go before we see heavy equipment without combustion engines. In the meantime, there are ways for industry leaders to incorporate burgeoning technologies that will hopefully pay off in terms of customer satisfaction and personal well-being.